Karine Seneca in August Bournonville's 'La Sylphide'. Photo by Sabi Varga, courtesy of Boston Ballet. “Less can be more,” – an arguably cliche phrase that, unfortunately enough, is preached more than practiced in modern Western culture. Among ballet greats, perhaps none embody this ethos more than August Bournonville (1805-1879). 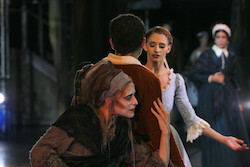 Boston Ballet exhibited this take with dedication to authenticity in La Sylphide. The title work was captivating and, in some ways, mystifying. Ashley Ellis was a delightfully mysterious Sylphide, and Lasha Khozashvili a compelling, memorable James. The set and costumes felt incredibly lifelike and authentic. I was right in the story’s unique world with the characters. 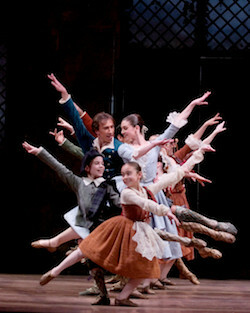 Boston Ballet in August Bournonville’s ‘La Sylphide’. Photo by Angela Sterling, courtesy of Boston Ballet. What intrigued me more in this performance, however, were three other Bournonville works performed before the title role – three works I didn’t expect to see that night. Relatively quick, enticing and beautifully understated in style, they left me feeling perfectly satisfied as an audience member. These works made me wonder how many more gems like these remain relatively little-known and underappreciated. Thus, this review will focus on those three works. They deserve a light shone on them, because they can shine right back. Pas De Deux from Flower Festival in Genzano opened the night, danced by Derek Dunn and Ji Young Chae. The work began with them walking in with an only slightly stylized pedestrian gate. With chivalrous elegance, Dunn offered Chae his hand. Then they began to truly dance. The pair set the precedent for refined restraint, letting the movement be what it is without having to push for higher, longer, and bigger. 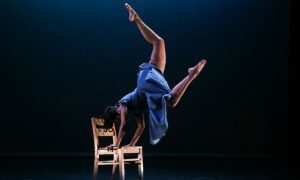 Their precision and grace allowed this understated feeling in the movement to be nonetheless captivating. Quick footwork, not without that impressive precision, also pulled me in. Pas de chaval into a chasé and small jeté was a repeated and intriguing staple of the movement. Their costumes were in a classic Romantic style, but in muted colors and without extraneous adornment. This understated elegance perfectly complimented the work overall. Elizabeth Olds and Melissa Hough in August Bournonville’s ‘La Sylphide’. Photo by Sabi Varga, courtesy of Boston Ballet. To end, the pair executed intriguing partnering, the kind performed a few other times in the work, with Dunn kneeling and Che in a wonderfully lifted and long arabesque. Bournonville’s work demonstrates adherence to the values of his time, yet also how he was in other ways ahead of his time – such as this chance for a woman to stand tall in her own right as compared to a man by her side. In a similar way, this work overall was both unassuming and inventive and its own right. A delightful all-male pas de deux followed, Jockey Dance from Siberia to Moscow. This work is another example of Bournonville casting aside ballet gender norms. In Apollo’s Angels, Jennifer Homans explained how Bournonville wanted to choreograph for men and women in similar ways, that no steps should be exclusively “male” or “female”. Samivel Evans and Alexander Maryianowski established their jockey characters with both technical command and heart. The movement was in some ways “flashy” and “big”. High battements and leaps conveyed the excitement of the horserace. In context, the joyful exuberance wasn’t uncalled-for. “Extra? It’s in the worst taste,” Bournonville is reported to have said. This wasn’t extra; it was fitting. On the other hand, relatively simple, subtle movements – such as heel beats and some lower jumps into attitude – also helped create these jockey characters, in all their race-day excitement. Also intriguing was this snapshot of everyday cultural life of the time. The program notes shared Bournonville’s interest in cultures outside of Europe, and portraying of these cultures in dance. Patrick Yocum and Anaïs Chalendard in Bournonville’s ‘La Sylphide’. Photo by Liza Voll, courtesy of Boston Ballet. In that vein of extra being in bad “taste”, an everyday-life scene was enough of a focus for him. A fun element of that grounded cultural connection was the dancers’ whips, and their authentic red and white jockey costumes. They used the whips like mock horses through leaps and humorous gestures. The audience responded with pleased laughter. The specific movement, as accomplished as it was, felt less important than the overall experience. The third piece, Pas de Six/Tarantella, was part pure movement and part pure joy. Lifts, backbends and other virtuosic elements were present fairly soon after the work began, but still with the classic Bournonville elegant understatedness. Pauses came in to create stately and aesthetically harmonious tableaus. Also memorable was female/female partnering, filled with a sense of sisterly support – another demonstration of Bournonville’s challenges to traditional ballet gender roles. Contrasting these lifts and paused moments were beats in small jumps and sequences of quick leaps such as cabrioles. Quick bourrées were also frequent, allowing for fast and neat travel. At one point, these bourrées brought most of the ensemble to the back, while three dancers danced centerstage. Casual walking and other simple movements, with facings and eye contacts, brought a social feel – as if they were chatting and gossiping. It was clear Bournonville was more interested in naturalistic human presence than in anything overly “staged” – “extra, it’s in the worst taste.” Even in this quality, there was a sense of back and forth and other dynamic directional shifts. A phrase of piqué piqué battement temps levé, for instance, created such dynamic shifts. Larissa Ponomarenko in August Bournonville’s ‘La Sylphide’. Photo by Angela Sterling, courtesy of Boston Ballet. 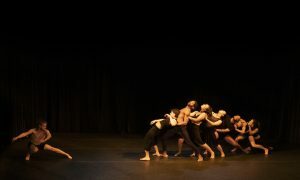 Then other dancers entered to create a larger ensemble. The music and movement picked up speed. Apart from the ensemble change, folk dance signatures signified that this was the Tarantella section. These movements included heel taps front and back and quick steps sideways. Balancé turns, emboîtés, and enveloppés were ballet staples that gave a technical base. Yet, again, the movement didn’t seem to be the most important thing. The feeling in the air was what felt most salient. The dancers’ technical finesse and command were a foundation on which their absolute joy could stand tall and proud. Different groupings and occasional cannon added a frame to all of that, to ensure harmony and a pleasing aesthetic. 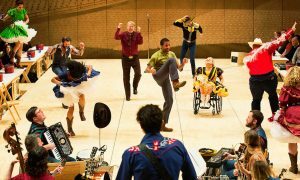 The dancers also held cymbals, adding an extra auditory layer as well as one for the cultural feel of the piece. Romantic tutus with bodices, and Romantic cuts in the tops and pants of the danseurs, did the same visually. It all came together to create a truly memorable experience. With no one element out there to steal the show, so to speak, all of the elements could come together to allow for that wonderful creation. Perhaps this is the true wisdom of Bournonville. As more and more years pass, let’s not forget it.